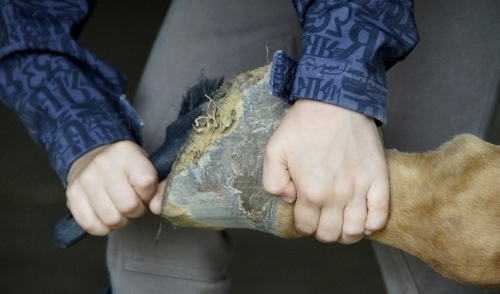 Hoof quality is affected by several factors including genetics, environment and nutrition. Some horses inherit weak hooves and that can’t be changed, but proper care and nutrition can help develop and maintain the best hooves genetically possible. On the other hand, a horse may have the genes for great hooves, but improper care and inadequate nutrition can lead to hoof problems for that horse. Energy or calorie content of the diet can have an impact on hoof growth. Research has shown that feeding young, growing horses a lower calorie diet, which led to reduced weight gain, also resulted in slower hoof growth. Protein deficiency can have the same effect as energy deficiency since hoof structure is primarily keratin, a protein. Fats are needed by the hoof to create a permeability barrier which assists in cell to cell adhesion, helping prevent bacteria and fungi from penetrating the horn. Diets containing adequate levels of fat can therefore be beneficial to the hoof. A proper balance of minerals is also important to hoof growth and quality. For example, zinc has been shown to be important in the normal keratinization of the hoof. Horses with insufficient hoof horn strength had less zinc in the hoof horn and plasma than did horses with no hoof horn damage. Calcium and phosphorus, and the ratio of one to the other, also has an impact on hoof development. The most investigated vitamin related to hoof growth is biotin, a water soluble vitamin that is manufactured by microbes in the digestive system. Controlled studies have reported varying results on the effect of biotin supplementation on hoof growth and quality. Some studies found biotin supplementation to help some horses grow better hooves, other studies found no advantage and one study reported a reduced growth rate with biotin supplementation. With horses that have poor hoof quality despite good environment and balanced nutrition, there may be some benefit from a therapeutic dose of biotin supplementation. But for the majority of horses, a diet with naturally occurring biotin, a good amino acid and fatty acid balance, and proper vitamin and mineral fortification will support excellent hoof growth rates and quality of growth. There are several nutrients that can exert a direct influence on the growth rate and integrity of the hoof. It is the balance of these nutrients with each other that is most important in the growth of a normal hoof.